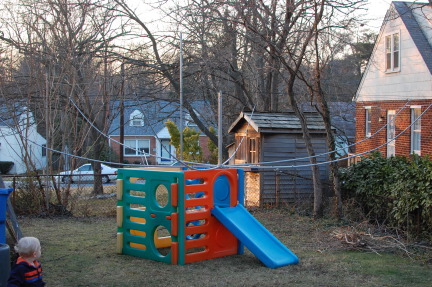 “What have you done to my play set?” This gym made a convenient place to string wires, etc. 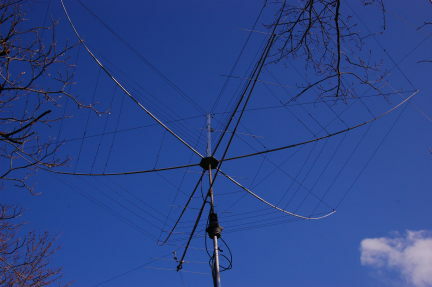 Two poles in the photo form part of the EWE RX antenna here at K8GU that was hastily erected before the NA Sprint CW. One of the poles is ty-wrapped to the play set. Doing my best to keep it klassy and impress the neighbors. And, we’re up in the air! The M2 9M2SSB is a little bit out of alignment due to the hex getting tangled in one of the antennas that it was due to replace. I have already realigned that. So far, the antenna seems to have useful front-to-back. Gain is hard to tell since I took down all of the antennas it was to replace. But, it does seem to work. I’m suffering from high SWR (above 3) on both 21 and 50 MHz. G3TXQ warns of interaction between 18 MHz and 50 MHz. Do not yet know the cause, but I’m looking into it. Although the antenna is relatively easy to handle, I don’t plan to make a habit of taking it down for work. Speaking of taking down, the 40m dipole whose center insulator is just visible behind the reflector of the 2-meter beam will be replaced by an as-of-yet-secret antenna. 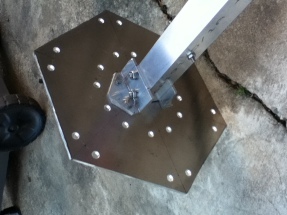 Construction project: G3TXQ hex beam built from scratch. 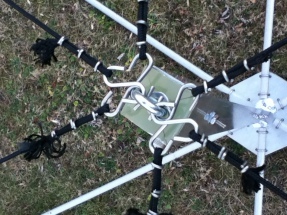 K4KIO directions with K8GU modifications (and reverse-engineered square coaxial center post). Details to follow once I determine it works to my satisfaction.